Starting to reflect the span of the generations that now characterize workplaces, BWBR’s leadership welcomed a new class of leaders in the past year who bring a diverse skillset and perspective to the team. 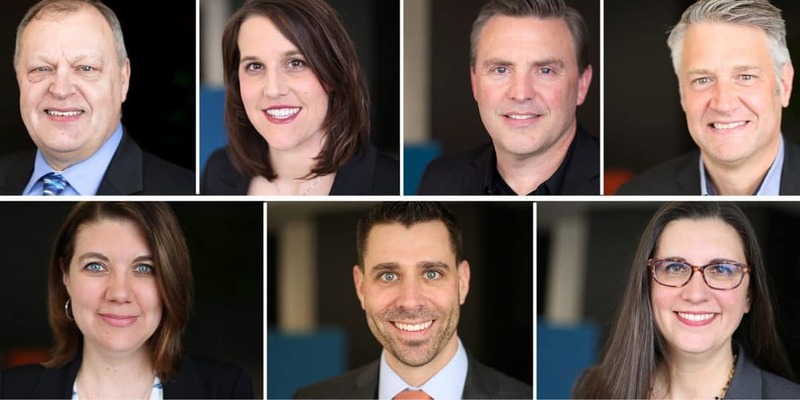 The seven newest members named principals at the 96-year-old firm all rose through the ranks in the firm: Melanie Baumhover, AIA, LEED AP BD+C; Ryan Johansen, AIA; Stefnee Trzpuc, CID, EDAC, LEED AP; Mike Meehan, AIA, LEED AP; Craig Peterson, AIA, LEED AP; Bruce Larson, AIA; and Terri Ulrick, AIA, LEED AP BD+C. The promotions bring representation from multiple areas of BWBR. In her 17-year career, Baumhover has focused on projects that have a dramatic impact on the health and wellbeing of individuals, from specialized treatment facilities to social services centers. Her work on centers that serve vulnerable populations looking for help and dignity have made her a thought leader in Human-Centered Safety® design. Originally from Waconia, Minn., Baumhover holds a bachelor’s degree and a master of architecture degree from the University of Minnesota. Johansen, who has spent the last 13 of his 19-year career at BWBR, specializes in health care, designing for both large urban health systems and smaller community-based organizations. Influenced by his upbringing on in rural North Dakota, Johansen’s work is characterized by a commitment to crafting high-quality healing environments for the communities that they serve. A native of Mohall, N.D., Johansen graduated from North Dakota State University with degrees in architecture and environmental design. Driven by a passion for problem solving through data analysis, Trzpuc leads BWBR’s design research and knowledge management program. Working with staff, she develops practice-based research projects and uses the findings to enhance design solutions for clients and foster knowledge sharing, both within and outside the firm. Trzpuc, a Washburn, N.D., native, received an interior design degree from North Dakota State University and a master’s degree in design from the University of Minnesota. Meehan, a 24-year veteran of BWBR, combines his architecture background with a talent for professional development initiatives and project management processes. Meehan fosters staff development, identifying interests and passions of staff and aligning those with the needs of clients and project teams. He also leads initiatives to build diversity and identify new talent. A Cedar Falls, Iowa native, Meehan is a graduate of Iowa State University with a bachelor of architecture degree. A 27-year veteran designer who has spent the past 20 years at BWBR, Peterson has influenced the design of a variety of projects at the firm, from college residential halls and high-tech science buildings to hospitals, athletic facilities, and churches. More than a design philosophy, Peterson brings a design approach that engages stakeholders to develop a common vision and create ownership of a design solution. He is a native of Warren, Minn., and has degrees in architecture and environmental design from North Dakota State University. Larson, who has spent the past 21 years of his 30-year career at BWBR, specializes primarily in managing and design health care projects, large and small. With a reputation for attention to details, Larson’s work as an architect and project manager on community-oriented facilities is matched by his passion for enhancing the lives of residents who access services in those buildings. A native of Isanti, Minn., he is a graduate of North Dakota State University with degrees in architecture and environmental design. A former in-house architect for the U.S. Army, Ulrick works on projects that push the boundaries of physics, engineering, bio-engineering, and medical device manufacturing. In her 12 years at BWBR she has designed clean rooms, laboratories, manufacturing spaces, and research centers that facilitate collaboration to lead to new discoveries and products. Ulrick earned a bachelor’s degree in architectural studies from the University of Illinois at Chicago and master of architecture degree from the University of Minnesota.